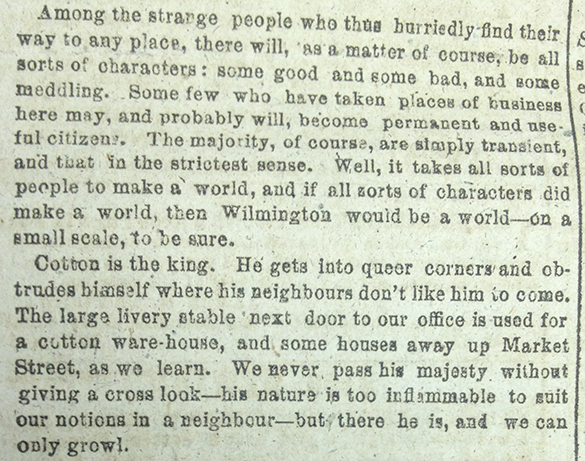 Item Description: “Wilmington” (editorial), The Daily Journal (Wilmington, N.C), 29 October 1863, page 2, column 1. No one familiar with the aspects of this place prior to 1861, can fail to recognize the marked difference in the Wilmington of ’61 or ’63. It is indeed a changed town. We speak now of the inhabitants, or at least of those to be met upon its streets and who throng in public places. War, of course, brings changes. The fear of attack has made very familiar permanent refugees, and to this cause was superadded the ravages of the epidemic, causing the town to be as nearly deserted as a town could well be. We need not add that Wilmington has given liberally of her best and bravest to the cause of the country. The stoppage of the usual channels of trade of course arrested or changed the current of trade here, and shut most stores and warehouses. Thus, for a time nothing or next to nothing was done. To this state of things rapidly succeeded a new and different era. 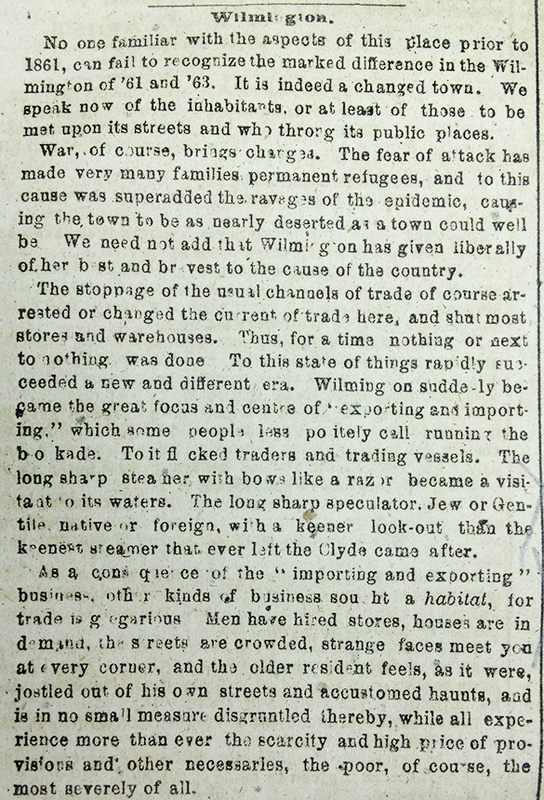 Wilmington suddenly became the great focus and centre of “exporting and importing” which some people less politely call running the blockade. To it flocked traders and trading vessels. The long sharp steamer with bows like a razor became a visitant to its waters. The long sharp spectator, Jew or native or foreign, with a keener look-out than the keenest steamer that ever left the Clyde came after. As a consequence of the “importing and exporting” business, other kinds of business sought a habitat, for trade is gregarious. Men have hired stores, houses are in demand, the streets are crowded, strange faces meet you at every corner, and the older resident feels, as it were, jostled out of his own streets and accustomed haunts, and is in no small measure disgruntled thereby, while all experience more than ever the scarcity and high price of provisions and other necessaries, the poor, of course, the most severely of all. Among the strange people who thus hurriedly find their way to any place, there will, as a matter of course, be all sorts of characters: some good and some bad, and some meddling. Some few who have taken places of business here may, and probably will, become permanent and useful citizens. The majority, of course, are simply transient, and that in the strictest sense. Well, it takes all sorts of people to make a world, and if all sorts of characters did make a world, then Wilmington would be a world—on a small scale, to be sure. Cotton is the King. He gets into queer corners and obtrudes himself where his neighbors don’t like him to come. The large livery stable next door to our offices is used for a cotton ware-house, and some houses away up Market Street, as we learn. We never pass his majesty without giving a cross look—his nature is too inflammable to suit our notions in a neighbour—but there he is, and we can only growl. This is a sort of a hasty sketch of a town in a transitionary and abnormal state of society,—in fact of Wilmington at the close of October, 1863. Strangers fin it dull—old residents find it even duller. But all are after something, and, you may rest assured that they pursue their object with no small energy. It is a queer state of things certainly, but then it cannot last. Things will settle down—find their level, or some sort of level, and this queer, unpleasant, half good and half bad excitement, become a thing of the past. As Mr. M. Cronly would say—it will soon be going! gone! What will take its place remains to be seen—not the enemy we trust. The fact of the want of Hotel accommodations, always a hard case in Wilmington, has now become a crying, yea a roaring and bellowing evil,—a howling out and cursing evil—one that is tolerable and not to be endured. How much cursing we have heard from the bearded lips of irate men with carpet-bags, no man could tell, and we could not tell ourselves. We know—not exactly a bank whereon the wild thyme grows—but a most noble oak—a live oak we think, where upon a full company could roost with great comfort and some security. Persons of good character might get accommodated at reasonable rates, if timely application be made—we would say at this office, but we fear the rush. 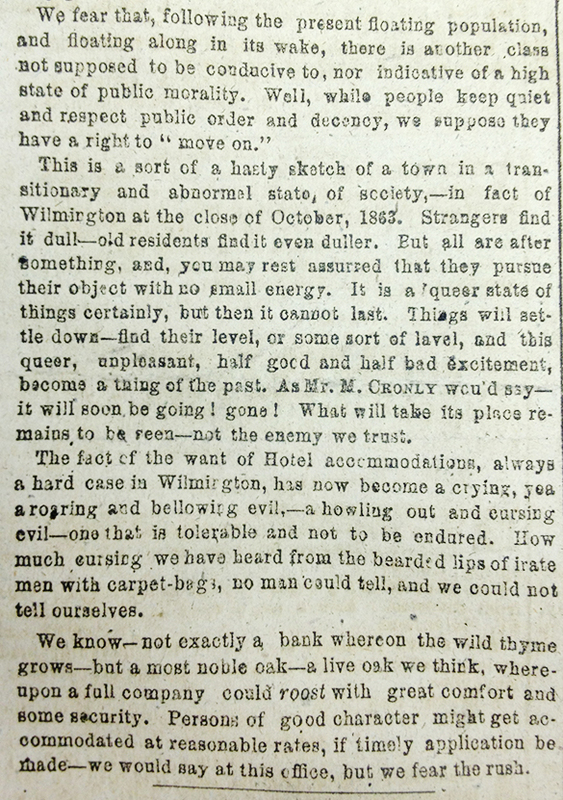 CITATION: The Daily Journal (Wilmington, N.C.), 29 October 1863, page 2, column 1. North Carolina Collection, Wilson Special Collections Library, University of North Carolina at Chapel Hill; call number C071 Z. This entry was posted in North Carolina Collection and tagged blockade running, cotton, epidemics, hotels, inflation, newspapers, refugees, strangers, trade, transportation, Wilmington (N.C.) Daily Journal, Wilmington (NC). Bookmark the permalink.